A group of four- and five-year olds are marching down the hallway, waving ribbon sticks and singing an old traditional tune about apples. A dragon is resting on a nearby table while a volunteer sews one of its ears. Six teens are heading upstairs to rehearse with bells tied around their ankles, adding whimsy and celebration to the already joyful scene. And in a nearby park, a group of volunteers is leafing through a songbook choosing songs to share at the evening’s Community Sing. 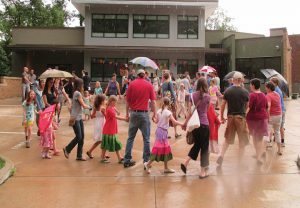 This is just an ordinary autumn day at Washington Revels, a 35-year-old cultural institution dedicated to celebrating cultural traditions through music, dance, storytelling, drama and more. 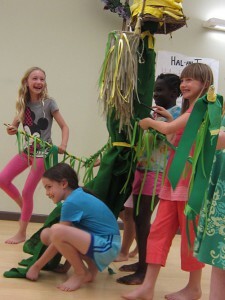 There’s something for everyone — after-school workshops for PreK-6th grade, opportunities for children and teens to perform on stage, and family activities ranging from Community Sings, Pub Sings, concerts and parades, plus workshops (in music, dance and traditional crafts) — over 120 events each year. It’s a place where intergenerational interactions are a part of daily activities, a place where a family is invited to share in the joys of singing and community, and a place where traditions are honored, shared and created. Join in a Revels program to share in some singing, dancing, celebrating and grinning, and experience the spirit of Reveling! 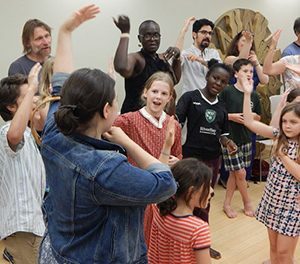 Try the September family-friendly Community Sing, or enroll your children to be Little Dragons, Hobby Horses or Jesters after school, or consider your child to try our during the Children’s & Teen Christmas Revels Auditions.